Other Products by Vusion. Search other Green Tea Supplements products. 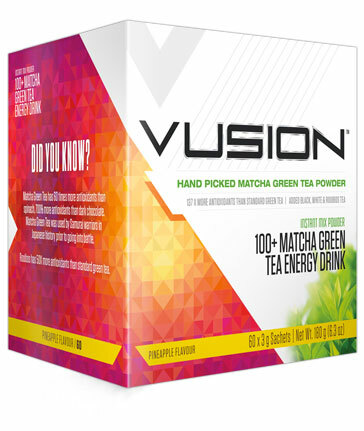 Vusion Matcha Green Tea is a super anti-oxidant drink designed to provide you with the power of green tea and so much more… More antioxidants, more variety, more quality, more vitality and more energy. Vusion starts its formula with a handpicked Matcha Tea Powder. Mix 1 - 2 satchets (3-6g) with 315 - 630ml of cold water. Consume no more than 2 servings per day (630ml).